Look for Barat Education Foundation at NCSS 2018. We are excited to engage with you. 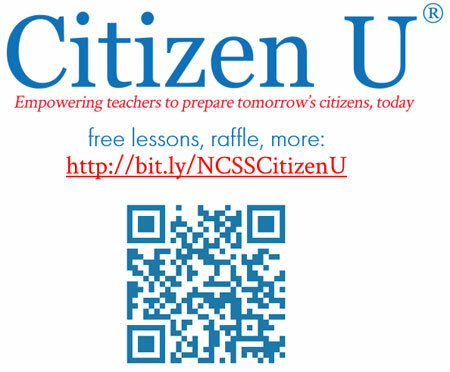 We will be showcasing Citizen U lesson plans, which integrate civics into math, science, English, and social studies, at our NCSS poster session on Friday, Nov. 30 from 3-4 pm: Innovative and Collaborative Teacher Transformation. Poster session #2229 (Crystal Ballroom Foyer, Lobby Level, West Tower) will delineate the ways in which Barat effectively collaborated with DePaul University and the Constitutional Rights Foundation California to provide teachers of English, Science, Math, and Social Studies with lesson plans (Citizen U) that use primary sources from the Library of Congress to integrate civics and teach through inquiry. The poster will describe the powerful transformation that occurred when teachers, in any discipline, are able to use the Library of Congress and inquiry to drive civic engagement and civic mindedness. Download the free lessons and teacher guides to join the movement and make a difference! You will also find us Friday after lunch at the Inquiry to Engagement: Connecting Across Differences strand at the Swissotel. Be sure to stop by our table before and after the closing plenary session at 2:45 pm—Better Arguments Project. We have lots of information and resources to share and we’ll have a raffle too! After, we will be stopping by the #SSChat Unconference also at the Swissotel in the ballroom from 4-7 pm. Additionally, you can connect with us at the TPS Poster Session starting at 10:30 am. Below is the session schedule for additional TPS Consortium partners.